We try to keep track of publications that cite use of NIGHTSEA equipment. These are mostly research-oriented papers, but we were excited to find a paper in the Journal of Microbiology and Biology Education that describes a laboratory sequence for a sophomore-and-above Genetics course at Rollins College. (Citation and links at the end of this article.) The goal of the sequence is to have students understand mutation, gene expression, and regulation through a hands-on experiment. The open-access publication presents the idea and methods in detail, including assessment of how well the laboratory exercise met the stated learning objectives. The laboratory sequence is an inquiry-based lesson plan in which students use rolling circle mutagenesis of GST (glutathione S-transferase)-mCherry. In layman’s terms, they use a gene that builds a fluorescent protein (mCherry), tag it with another protein (GST) and insert it into a genetic structure that can replicate independently (plasmid). The mCherry protein imparts a pink color and also fluoresces red. The experiment uses a technique called error-prone rolling circle amplification (RCA) that provides multiple opportunities for things to go wrong, creating mutant forms. The students then determine whether a mutation has occurred by using color and fluorescence to assess colony phenotype. Colonies that are not mutated remain pink and still fluoresce red, while mutated colonies lose both of these characteristics. 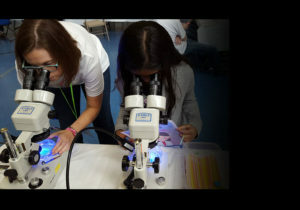 Students use the NIGHTSEA Model SFA Stereo Microscope Fluorescence Adapter system with the Green excitation-emission set on laboratory microscopes to conduct their phenotype analysis and screen for successful mutation. Images of individual colonies on agar plates are made using the fluorescence coupled with a digital camera. If a mutation has occurred students attempt to identify its location by isolating plasmid from these mutant colonies, sequencing the DNA, and comparing their mutant sequence to the wild-type sequence. To assess their success and learning, students were asked to generate a complete laboratory paper detailing their experimental design, methods, results, and discussion. In field testing this lesson plan in fall 2015 and fall 2016, the researchers found that students were capable of generating mutations, using bioinformatics analysis to translate, align, and understand their mutations, and correlating their mutation results to phenotype. More than 90% of students achieved their learning objectives for 5 out of the 7 means of assessment. Well-designed experiments that lack a predetermined outcome are a great way to have students learn substantive material while experiencing the realities of laboratory research work. We are pleased that the NIGHTSEA equipment could play a small role in bringing this experience into the student laboratory setting. Cole J, Ferguson A, Segarra VA, Walsh S. Rolling Circle Mutagenesis of GST-mCherry to Understand Mutation, Gene Expression, and Regulation.Â Journal of Microbiology & Biology Education. 2017;18(1):18.1.14. doi:10.1128/jmbe.v18i1.1201.